Do your kids spend as much time playing outside as you did when you were young? According to experts, probably not. It’s rare these days for kids to spend entire afternoons rolling down hills, climbing trees, or enjoying lengthy recesses at school where they swing too high and push merry-go-rounds too fast. Instead, these once-classic childhood activities have been replaced by adult-supervised ones, such as organized sports, accelerated academics, and of course, screen time. We’ve done this, of ... See More course, because we largely believe that kids are safer this way. But could our attempts to keep kids out of harm’s way be hindering their development? 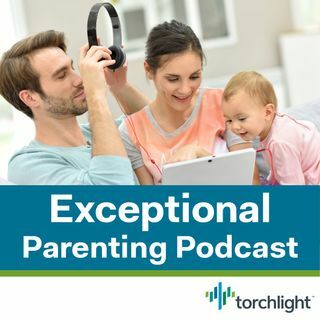 Tune in as Exceptional Parenting Podcast host, Stefanie Boucher, speaks with pediatric occupational therapist, international speaker, Timbernook founder, and author Angela Hanscom about how unrestrained physical movement and outdoor play are vital for your child’s cognitive and physical development - and why a lack of it may be (at least partly) to blame for today’s epidemic levels of attention deficits, as well as sensory and emotional disorders. Angela Hanscom is a pediatric occupational therapist and the founder of TimberNook – an award-winning nature-based program that has gained international popularity. She holds a master’s degree in occupational therapy, and an undergraduate degree in kinesiology (the study of movement) with a concentration in health fitness. Angela’s book, Balanced & Barefoot: How Unrestricted Outdoor Play Makes for Strong, Confident, and Capable Children, (New Harbinger Press, 2016) discusses the effects of restricted movement and lack of outdoor playtime on overall sensory and motor development in children. Angela keynotes conferences and conducts workshops for parents, educators, and clinicians all over the world. She and her work have been featured in Glamour magazine, The Washington Post, NPR, and Johnson & Johnson TEDx. Don't miss these great resources from Angela Hanscom! Hanscom, Angela. Balanced & Barefoot: How Unrestricted Outdoor Play Makes for Strong, Confident, and Capable Children, (New Harbinger Press, 2016). Hanscom, Angela. "The Real Reason Children Fidget - And What to Do About It." YouTube video, 25 Sep, 2018, https://www.youtube.com/watch?v=PXLaoDucF0k.